This month, I've answered several queries on messenger and whatsapp for friends and strangers who had their tickets on Jet Airways coming up and not sure what will happen to them. I am not an expert in giving solution to massive crisis like that of Jet Airways and I don't have any magic solution for affected passengers either. But within the rules of engagement between passengers and airline, with whatever little knowledge I have from traveling around the world and running an airlinebog and a travel blog, I though it will help to answer those queries in public for the benefit of passengers with an upcoming jet airways flight. Q1. I have a Jet Airways flight coming up. Will they operate? Should I cancel? Will I get refund? 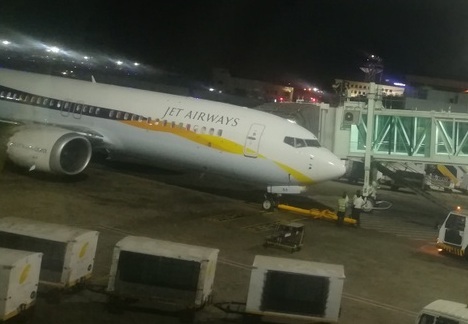 Jet Airways has already grounded almost 75% of its planes and is operating a minimum network. Jet doesn't announce cancellations well in advance so there's no way of knowing how much more worse it will get say by end of April. There's a planned strike as well. If you cancel voluntarily before airline announces cancellation, you'll be charged a hefty cancellation fee, which could be more than ticket cost itself. If your flight hasn't been announced cancelled yet, what will happen next or what you should do is a function of multiple factors. What best you can do is a function of how flexible you are to cancel the trip, how much money is at stake, how much time you've till travel date and if you've booked on Jet Airways website/OTAs or with another airline. Below table will serve as a quick reference guide depending on these combinations. No point paying 4-5k per passenger or more to cancel. Risk: Airline shuts down and you get zero refund or cancels 2 days before departure/return flight etc- Take a call next month to assess. Wait till April first week- If pilots go on strike, more aircrafts grounded, no one infusing money- Mostly airline itself will cancel flights and you will be eligible for full refund. Leave jet ticket as is, as cancellation cost will be huge and not worth it. Cancel jet ticket, get whatever refund you can get, book on alternate airline. Wait till April 1st week- if there’s no positive news and you don’t want to risk your money/trip, cut your loss, cancel. Book another ticket on Indigo/Vistara Spicejet. Leave jet ticket as is, as cancellation cost will be huge and not worth it. Wait for them to cancel, or if you are ok to take whatever refund you get, then cancel. If you’ve booked a ticket with Airfrance/KLM or Etihad etc with some legs operated by Jet Airways, respective airline is responsible to provide alternate flight. If you have some flexibility, you can work with respective airlines to either get proper refund or get on next best available flight. Have I missed any combination? Got any specific questions? Do ask/share your thoughts. Q2: I see some good prices on Jet Airways website- Should I book? I hate to say this, but at this moment, not advisable. While they are cancelling lots of flights last minute, the website is selling tickets for future dates on cancelled routes. [Read this post] My guess is it is a desperate attempt to raise some cash, without any serious plan to honor those tickets. Thus at this moment, hold on to your plans- at least wait till April 1st week to see if pilots go on strike or someone infuses money or the non-stop flight cancellations stop and some sort of schedule integrity sustains. Same thing what happened once Kingfisher closed down. Your ticket money is practically gone. Q4: How long Jet can survive like this? I am as clueless as you are. Their primary source of funding is ticket sales, which will be less and less each passing day, as airline is cancelling flights, losing its reputation and doesn't have much confidence left that it will operate remaining flights as planned. So I am sure ticketing revenue is on the decline since past few months- unless a turn around/additional funding is announced, soon people will stop booking altogether. Then funding day to day operation- fuel for the flights, paying salary also will be tough and airline will stop operating. This can happen as early as next month or may be if they get some lifeline from Government run banks (thanks to Election season) or anyone else willing to pump more money into the black hole, Jet may continue to operate its skeleton network for few more months. We can only wait and watch. Q5: What to do with JP Miles? You can redeem JP Miles for various gifts. You don't necessarily have to fly. So unless you strongly believe that Jet Airways will revive, redeem to something useful for you. Q6: How long do Jet Airways take to refund? Under normal conditions, 7 to 10 working days- that is if the airline has money and can release it to bank promptly to refund you. But twitter is full of complaints- not receiving refunds even after months, while a few have thanked airline for prompt refund. Thus I guess a bit of luck is needed to get your money back. Q7: My booking on Jet Airways was done via MMT/GoIbibo/Yatra/cleartrip/Travel agent etc- will they help me? No. These OTAs have no motive to take a loss and book you on another flight. At best they will transfer money once received from airline. In most cases these sites try to take their cut and refund only partial amount (because from their point of view, they have provided their part of service), triggering further anger from passengers. So be ready for some extra fight if your travel agent/website doesn't refund full amount. Jet Blue's romantic welcome letter! Delhi IGI airport T2- what to expect?